In the last article, we discussed about the Maven build life cycle in detail. In this article, we are going discuss about the types of Maven build profiles in detail. A build profile in Maven is a set of configurable values that can be applied to set or override the default values of the Maven build. A build profile in Maven helps customize the Maven build such as build for SIT (System Integration Test), UAT (User Acceptance Test), production, etc. A build profile is specified in pom.xml file with the use of its activeProfiles and profiles elements which can be triggered in number of ways. Various build profiles present in POM at build time provide parameters applicable to different target environments (e.g. we use different databases for development, SIT, UAT and production environments which can be easily switched using Maven build profiles). Maven has the following three types of Build profiles. This build profile is defined in the project POM file (i.e. pom.xml) at per project level. This build profile is defined in Maven settings xml file at user level i.e. at %USER_HOME%/.m2/settings.xml location on the user’s system. This build profile is defined in Maven global settings xml file i.e. at %M2_HOME%/conf/settings.xml location where Maven plugin is installed. The following are the number of ways to activate a Maven build profile. • Use of command on the input console explicitly. • Through the environment variables i.e. User or System variables. • OS Settings e.g. Windows, Linux, UNIX, etc. • Through properties or set up files. In the Maven project, under src/main/resources, the following are the three environment specific files i.e. environment.properties, environment.sit.properties, environment.uat.properties and environment.prod.properties. The default configuration which will be activated to use when no profile is mentioned. The SIT (System Integration Test environment) configuration which will be activated to use when SIT profile is mentioned. 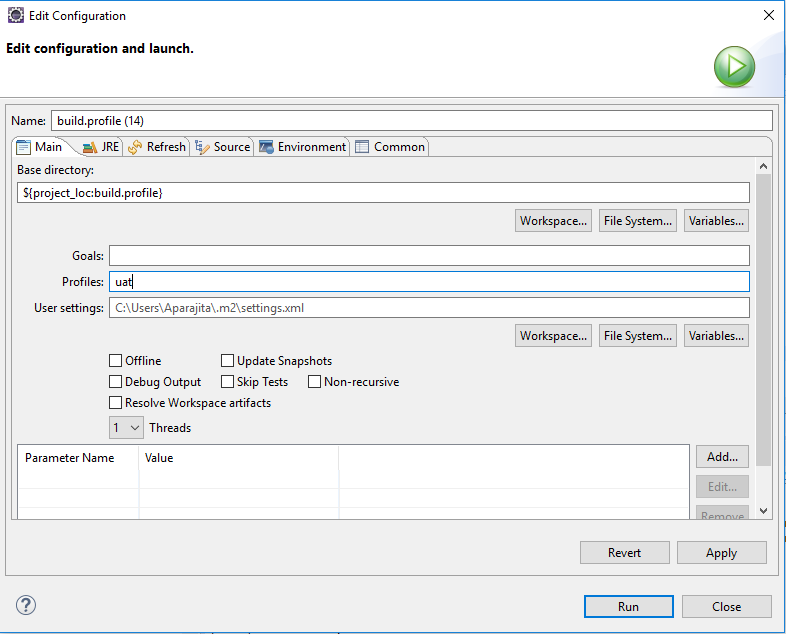 The UAT (User Acceptance Test environment) configuration which will be activated to use when UAT profile is mentioned. The Production configuration which will be activated to use when Production profile is mentioned. 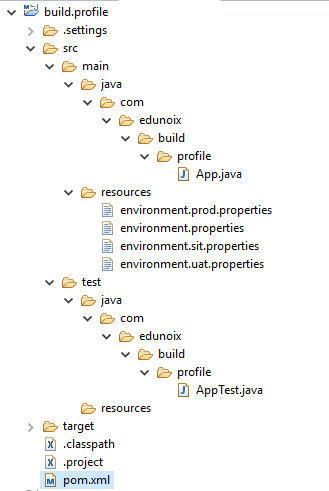 The following will be the typical file structure of a Maven project which is using various build profiles. 1. Explicit Profile Activation: – In explicit profile activation, an environment profile is activated while executing the pom.xml through Maven. Here in the pom.xml file, we have attached maven-antrun-plugin: run goal to test the phase which will allow us to print the given text messages for different profiles chosen for execution. We will be using pom.xml to define different profiles as default, sit, uat and prod and will activate profile at eclipse console which executing it as Run as  Maven build.. as shown below. The profile ‘uat’ will be successfully executed which will print the message that we have given under the task section in pom.xml. The following is the content of the pom.xml file. when we build the above Maven project with profile id as ‘uat’, then we can observe the following output log with the task printing the message as ‘[echo] Using environment.uat.properties’. 2. Profile Activation through Maven Settings: – In this type of profile action through Maven settings, the Maven settings.xml file which is available at %USER_HOME%/.m2 directory on your system is updated with the required profile activation details as shown below. Here, %USER_HOME% is nothing but the user home directory. In this case, we need not to provide the profile id explicitly while building a Maven build, but it is automatically transfered to pom.xml during the build time. We can observe the same output logs as before since we have activated profile id as ‘uat’. 3. Profile Activation through Environment Variables: – In this case, we provide the profile activation details through environment variables. Therefore, remove the profile settings from maven’s settings.xml and modify the ‘test’ profile in pom.xml as shown below. The ‘test’ profile will pick up the system property “env” which has the value as “uat”. When this pom.xml is executed it will provide the same output as we got in above two approaches. In this article, we discussed about building different types of Maven profiles along with a suitable example for each of the type. Visual Studio Code Is So Popular But Why? Why is Python So Popular Among Programmers?